Liverpool have been in electrifying form this season and sit second in Premier League table on 59 points. Tottenham Hotspur head coach Tim Sherwood is looking to the example set by Brendan Rodgers’ resurgent Liverpool as he plots for the future despite not receiving long-term assurances about his own position. Under the guidance of Northern Irishman Rodgers, Liverpool have been in electrifying form this season and sit second in the Premier League table on 59 points from 28 matches. With the Merseyside club now on course to qualify for the Champions League for the first time since 2009, Sherwood believes Spurs are in a similar position to when Rodgers took charge of Liverpool in June 2012. “I think a good example is Brendan at Liverpool, seventh they finished last year,” Sherwood told reporters. “We’re looking at where he is now and it’s a great example – that team plays exactly how he wants them to play. “Liverpool lost a lot of games last year, a lot of home games as well, and everyone was pointing the fingers, look at the rewards now. 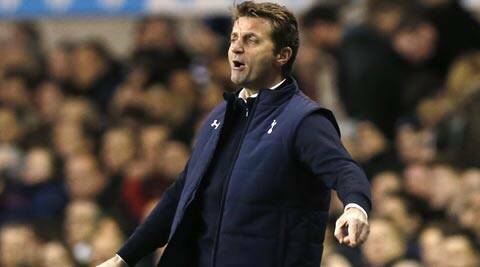 Sherwood has steadied the ship at White Hart Lane since taking over from Andre Villas-Boas in December and, with Spurs fifth in the table, he wants to be given time to develop his own style of play. “I see myself as more of a manager who builds something over a period of time,” said Sherwood, who has been on the coaching staff at Tottenham since he was appointed by former manager Harry Redknapp in 2008. “But I recognise at the moment that’s not possible because I have been dealt a hand here and I have to try and win games. “It’s not 100 percent how I want to play but unfortunately I don’t have the time, the club don’t have the time and the fans don’t have the patience for all that project stuff – you need to win games. Sherwood, who has lost twice in the league since taking charge, feels he is doing a good job, but acknowledges that other managers would like to replace him. “The club are going to keep their options open and decide what they want to do in the future,” he added. “If the club feel like they want to back me then it’s up to them, if they don’t then I’m just cracking on, I’m not going to be a different person for it.